We don’t play favorites when it comes to bus or streetcar. We simply want what’s going to get New Orleans transit riders where they need to go quickly and comfortably. The study itself doesn’t mean that a streetcar extension will happen. But – once completed – it means that a streetcar extension might be considered “shovel ready.” That means the RTA could start applying for federal grants to pay for the study as soon as later this year. All of those grants would require local funds to be spent as well. In a different context, a streetcar expansion wouldn’t be a big deal and might even be a positive. But right now, our transit system is not working for many – the average New Orleanian can only reach 11 percent of the region’s jobs in 30 minutes or less via transit. That means the number one priority needs to be to fix that problem. Unfortunately, the RTA’s recent approach to streetcars has not helped. And, with limited resources, if something is not helping, it is hurting. Limited available funds. While the RTA says they would apply for federal grants to pay for this expansion, those always require a local match. That could be at least $4-5 million for this project. Used in other ways, those funds would go a long way toward increasing service in key areas or supporting new bus and streetcar vehicle purchases for a fleet that is rapidly aging. What about the long-term transit plan? In 2017 the RTA spent almost $1 million on a long-term strategic plan – the Strategic Mobility Plan or SMP – to specifically guide decisions like this. We applauded that plan and the RTA for pushing it forward. But going forward with a streetcar expansion right now means ignoring that plan. The plan specifically identifies the entire St. Claude corridor as a top priority for high frequency transit, as well as improving CBD/French Quarter mobility. But instead of looking holistically at the entire St. Claude corridor or downtown mobility, the RTA is focused on this small piece. That means improvements transit riders desperately need to see could be pushed even further away. Not built for speed. 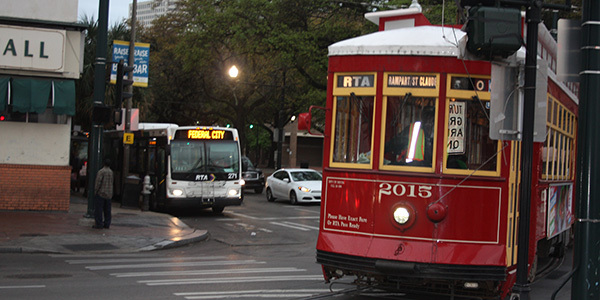 New Orleans streetcars are not fast and reliable – the key elements that riders need – because we don’t build them to be. Our new streetcars get stuck in traffic and can’t get around, they lack priority access to get through traffic signals quickly, and they don’t have modern fare collection techniques like pre-paid tickets and all-door boarding that cut down on delays. That means that we get very little quality transit bang for the big bucks we spend on streetcars. Until that design mindset changes, streetcars will be slower and less efficient. Fortunately, this is not a done deal yet. Even if the RTA decides that the project makes sense, they would still have to secure funding – which would have to come from a federal grant or RTA-issued bonds. But it’s important that you weigh in now and make sure the RTA knows that riders don’t want to see more investment in streetcars until we’ve taken care of other system-wide priorities and proven that new streetcar lines can deliver the level of quality service that riders deserve. There are two ways that you can do that. First, sign our petition asking the RTA to say no to any streetcar extension until we’ve better set up the system-wide priorities in the RTA’s long-term strategic mobility plan. Second, attend the RTA’s streetcar study open house on Tuesday, May 22 to let RTA staff know how you feel! The open house will be at Cafe Istanbul – 2372 St Claude Ave. There will be two sessions – one at 2 p.m. and one at 6 p.m.